The boxing world took a shot on the chin with the death of Bob Montgomery Sr., a former world lightweight champion and recent Hall of Fame inductee whose quartet of bouts with fellow Hall of Famer Beau Hack during the mid-1940s were legendary. 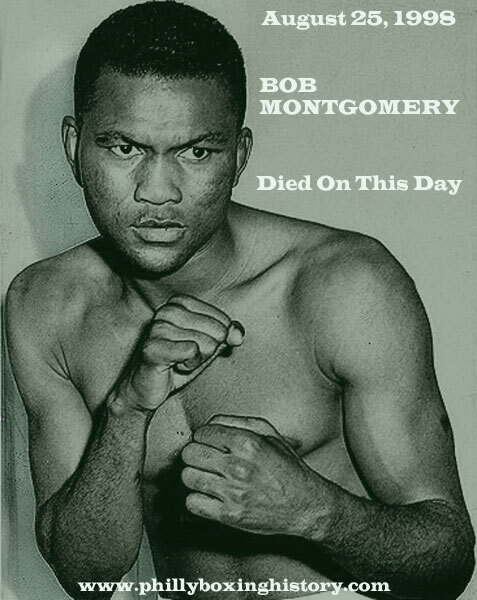 Montgomery, the New York world lightweight champion in 1943 and again from 1944 to 1947, died at 3:25 p.m. yesterday at the Coatesville Veterans Hospital. Nicknamed "The Bobcat" for the aggressive, pawing style he employed to corner his opponents, the 79-year-old ex-ring general was a fighter to the end. "More than likely, it was his heart," the fighter's son, Bob Jr., speculated. "He had a stroke recently, but he was recovering from that. He was in good shape until about a month ago." Montgomery compiled a professional record of 75-19-3 from 1938 to 1950. He fought a staggering 19 fights in 1939 alone and was named The Ring's top lightweight contender in 1941 en route to his first world title - a 15-round dethroning of then-champion Jack in 1943. The two went on to split a career-defining four-fight series, linking them in their time the way Muhammad Ali-Joe Frazier or "Sugar Ray" Leonard-Thomas Hearns are viewed today. Montgomery also split two non-title tilts with lightweight champ Lew Jenkins, lost two non-title bouts to Sammy Angott and split two ferocious battles with Ike Williams. "He was one of the best fighters ever to come out of Philadelphia," said local fight promoter and historian J Russell Peltz. "And he fought in an era when there were a thousand good fighters here." Montgomery was a world-beater in and out of the ring. He was an early champion of the civil rights struggle and marched with Cecil B. Moore and others protesting the color barrier. "He was the first black champion to tell the newspapers that if they didn't have black writers on their staff, he wouldn't give them an interview," Bob Jr. said. "He took a stand. You have to understand [the chance he took]. In those days, [a fighter's career] depended on the press." Montgomery fought for his country on several fronts during World War II. He was in the Army Air Corps in 1944 when he faced Jack for the fourth and final time in a sellout at New York's Madison Square Garden that pulled in what remains the largest gross live gate in boxing history. The $35 million gate went to buy war bonds, and corporations bought up all the ringside seats and filled them with injured and disabled veterans. The fighters were paid just $1,500 each in training expenses. Montgomery lost the 10-round non-title fight. Toward the end of his life, Montgomery lived for five years in his son's house in West Oak Lane. It was a far cry from his humble, hardscrabble beginnings in Sumter, S.C., as one of nine children of a sharecropper father and a Cherokee mother. At age 14, during the Depression, he drifted north and got a job in a North Philadelphia laundry. He began boxing at a gym known as "The Slaughterhouse" and turned pro in 1938 for a $25 purse he had to split with his cornermen and managers. Montgomery earned an estimated $1 million during his career and taught actor John Garfield some of his moves for the classic film "Body and Soul." Montgomery lived on his savings until they were depleted, then took jobs as a Ballantine Beer salesman and a city gang-control worker before his final retirement. He entered the International Boxing Hall of Fame in 1995. Daily News sports writer Bernard Fernandez contributed to this report. Leon Taylor was a Daily News Staff Writer when he wrote this obituary of Bob Montgomery. It was originally published in the Daily News on August 26, 1998.